Answer: I feel like I have something to share. But do I want to share things that are going to take people down with me? Not really. I would LOVE for the things I have to share to be worth someones time to read. There is so much in this world that is NOT worth our time. When I read an inspiring article, I want to go out and make the world a better place. Pay it forward. So while I started out to just write for me, I have to realize that when I put things out in the universe it’s going to effect people. I have to choose whether I want to effect people in a negative way or a positive way. I’d like this blog to not only be MY happy place, but your happy place too (if you happen to be stopping by)! So can we start over?? Thanks. Moving on. 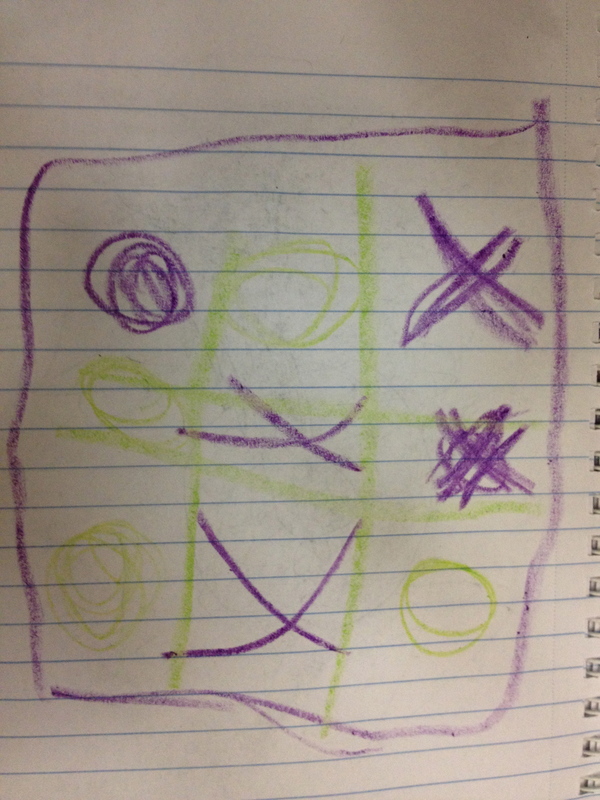 My daughter and I were playing tic-tac-toe the other day. Its not clear to me which one of us was X and which was O because they both look pretty haphazard. I’m pretty sure she was purple and I was green, and she decided she liked O better half way through. She has a pretty serious “loser” face so I braced myself when the only spot left was obviously not going to give her a win. But her response was “At least it made a pretty picture!” I love this girl. She teaches me so much. Loved this! Especially the part about “She has a pretty serious “loser” face so I braced myself when the only spot left was obviously not going to give her a win. But her response was “At least it made a pretty picture!” … You are an awesome pair!